Hobby Elements is a unique modeling company that is providing tools that others hadn't thought of before. The first one I reviewed, their Molding Flash Sander, was a unique way to deal with molding flash while retaining the shape of the original part. This time Hobby Elements provides unique sets of files to help to reach places that are difficult to get to with larger tools. 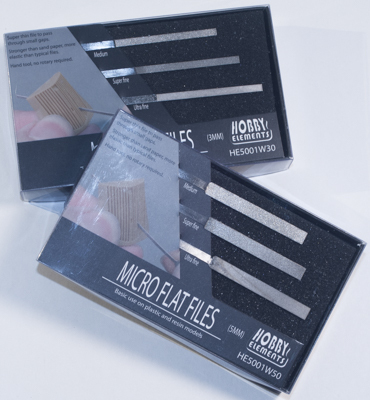 There are two sets of Micro Files, 3mm and 5mm. In all actuality you truly need both sets to make it complete. 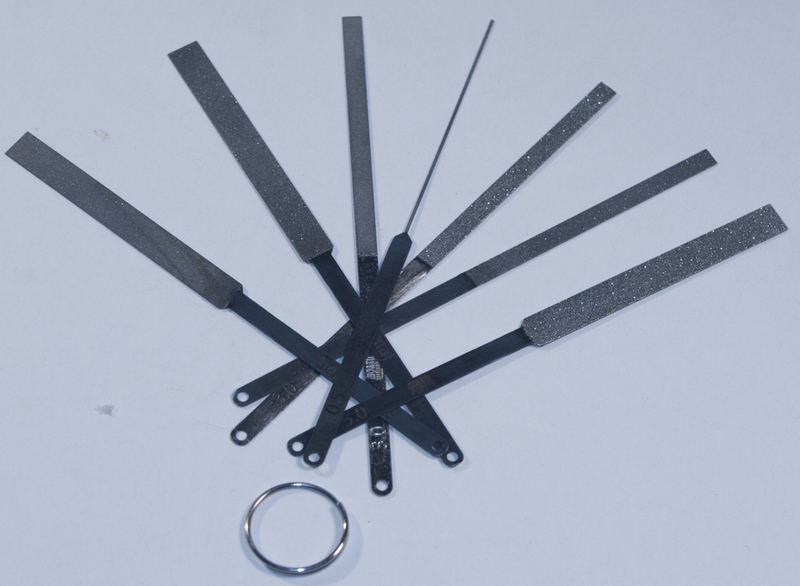 The extremely unique item in the 3mm set is the extremely thin file that will get into almost any space and help you deal with flash or any other type of imperfection in the kit part. I have used this very thin file and it works great. Granted, you'll need to take your time while using these files: the grit, while aggresive, isn't a lot to just make a couple of passes on the part and be done with, you'll need a few back-and-forth swipes to truly remove the imperfection. Use a light pressure and let the file handle the removal of whatever material is in the way. These are a great addition to your modeling tool chest. However, you need to be quick about ordering them as the company states they're running out and doubt they'll remake them. I definitely thank Hobby Elements for the review set. Either visit their Facebook page or send them an email to order these files.